One of the few remaining structures bearing the scars of Lebanon’s fifteen year civil-war (1975-1990) is Beirut’s Barakat Building. This once stately and aristocratic edifice straddles a key intersection near the centre of the capital. The four-story avant-garde building was designed by two architects in the 1920s and 30s and fused Art Deco elements with oriental motifs. 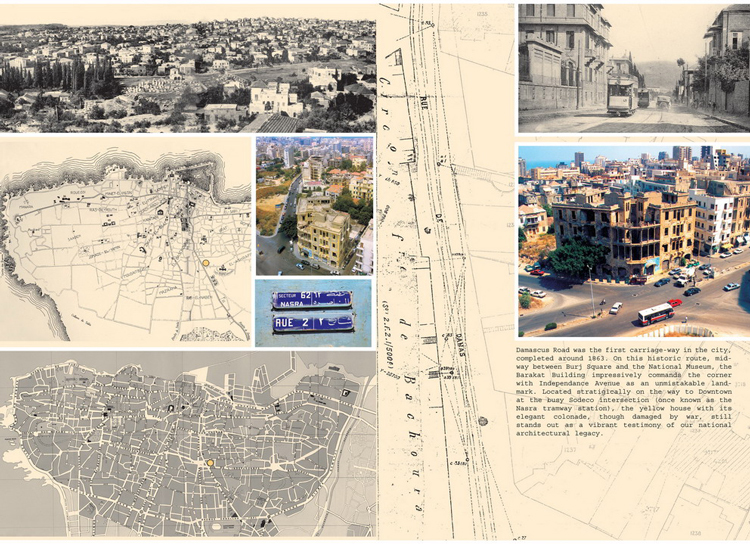 During the war it sat astride the city’s so-called “Green Line”, dividing the Christian and Muslim quarters of Beirut. Almost overnight the building became a magnet for snipers who turned the structure into a kind of killing machine. Its unique design aided the gunmen who could perch deep within the building’s interior, yet still find visual corridors to their victims on the street. The corner where the building sat saw some of the worst fighting during the war. Its pockmarked facade, and the damage it sustained, speaks to the prominent position it held on the front lines. Mona el-Hallak, a Beirut architect and heritage preservation activist, has waged a long and tireless campaign to save the building from demolition. 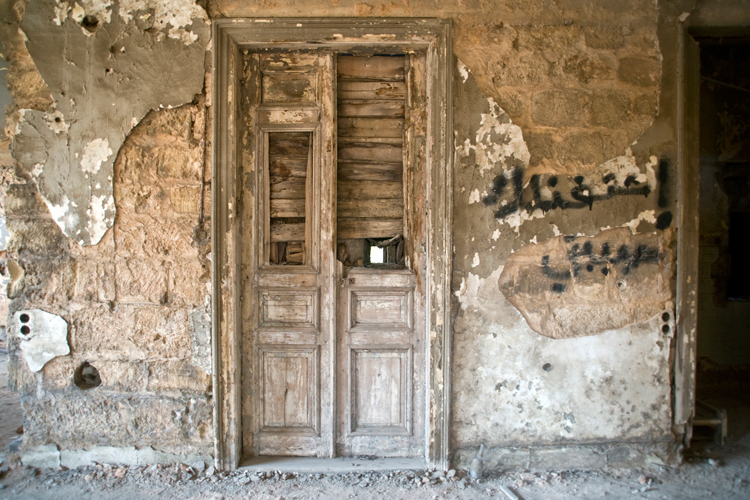 As a result of her efforts the Barakat building is now being renovated and converted into Beirut’s first museum of memory, war and contemporary history. 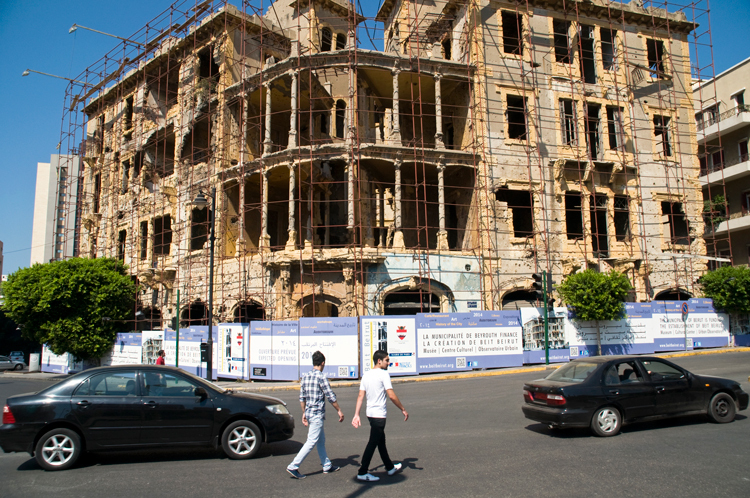 The $10 million project, dubbed “Beit Beirut”, is being undertaken with the assistance of European partners and is slated for completion in 2015. In this interview Mona talks about the history of the building, and her struggle to turn it into an educational tool to teach people about the city and help cure what she calls Lebanon’s “amnesia” about the civil-war era. What is the early history of the Barakat building? In 1924, Nicholas and Victoria Barakat hired a man named Youssif Aftimos to design them a building. Aftimos was a famous architect at the time, who had designed many prominent buildings in downtown Beirut. The Barakats wanted a place where their family could live, and where they could also rent out space. They only had enough money to build the first and second floors, and so they proceeded with that first stage of the project. The building, which occupies a main corner and looks onto three streets, was brilliantly designed. Nearly every other building of that period filled the corner space with the most prominent feature, like the main living-room. But in the case of the Barakat building, Aftimos created a void of empty space in the corner. By doing so he gave every room in the building, even those in the back, a view to the street. In a way the void became more important than the building itself. It provided both a huge amount of light to the interior and transparency to each and every room. Wherever you stood in that building you could see directly onto the closest street – or into the back garden. At the same time you also had a view to the front. This was hugely significant in the planning of the building. Aftimos built the first and second floors from sandstone. Later, in 1932, Victoria Barakat decided to do some additional work to the building. She also had in mind to add two more floors. She was a bourgeois lady and was increasingly frustrated when the catering for cocktail parties had to come up the main stairwells, past the invitees, to reach the kitchen. Because Aftimos was too busy at the time, she sought another architect who would construct an alternate staircase. That young architect, Fouad Kozah, who was fascinated by a new building material called concrete, sketched a staircase for them that came up through the back garden. The Barakats liked the design and gave him permission to build it. So Kozah built the third and fourth floors. He used a lot of concrete additions and details. Because of that, the building also became a living archive of the transition in building techniques owing to the development of concrete. Kozah also made additions to the original architecture. Yes. Beyond using concrete, Kozah bridged Aftimos’s void with a cornice that connects the two parts of the building. It created a visual impression that the building is one piece and is connected from right to left. But in reality when you look closer, you see that the void cuts deep into the building, and all the way up to the sky. This for me has significance because when you look at the building it looks like a solid entity with a strong connection between the two masses. You don’t easily see the void. Because of this, I’ve always seen the building as a mini-Beirut – and a mini-Lebanon. We always claim that we’re united despite our divisions. But when you look closely, we’ve always been divided. We’ve been divided East and West. We’ve been divided as Muslims and Christians. And now we’re divided between political movements. God knows how else we’ll be divided in the future. Who was living there prior to the civil war? The Barakat family lived in four apartments. The other four apartments were rented out to other Beirut families. On the first floor on the east side lived a dentist named Negib Schemali. In the apartment on the west side lived a Palestinian Christian family with the surname Fellaha. This is very ironic because you had the Palestinian Fellahas on one side, and the Maronite Phalangist Schemali on the other. Both were separated by the architectural void in the middle. The civil war started when Maronites shot Palestinians on a bus in Ain al-Remmane in 1975. So, it’s interesting that these two people lived happily across one another in that building prior to the war. So what happened when the war began? When the war broke out, one of the first demarcation lines laid down was the Sodeco line. 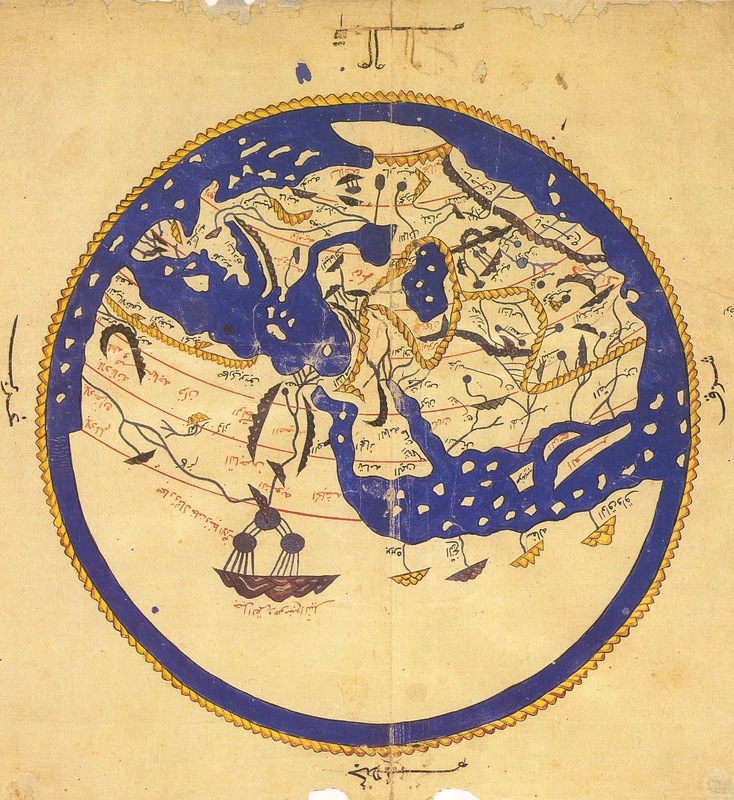 It ran from downtown Beirut all the way to the National Museum and beyond – along part of the old road to Damascus. The Barakat building held a prominent and strategic position at a key intersection on that line. And it became a very difficult place to live. There was a lot of fighting in that area, and by the middle of 1975 the people living in that neighbourhood were forced to leave. Those residents gave way to snipers who found in that building the perfect hideaway. The architect had designed it with visual transparency and many visual axes that connected the back of the building to the front. And that’s exactly what snipers need. They need to be protected in the back – while at the same time having an eye to the street. So, overnight the building turned into a kind of killing instrument. The snipers not only added the usual sandbags, but they actually built their own architecture within the original architecture. 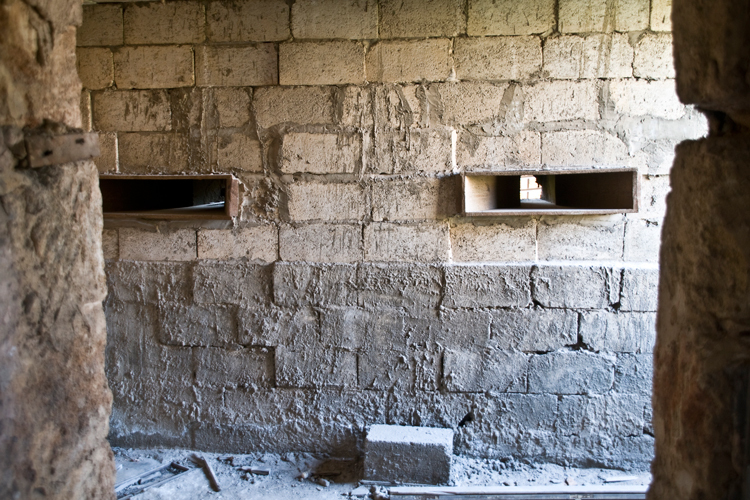 You can find stacked sand and concrete walls that were almost two metres thick and that had wooden peephole installations that allowed the snipers to focus their guns at different levels. Some of the snipers were able to kill while standing; others placed their peepholes on the ground so that they could kill while lying down. In every room of the building, there were three or four snipers shooting in different directions. They were sitting behind two metre walls of concrete, very well protected, and were peering through 10cm x 10cm holes at the world outside. Whoever passed by in the street was a target: whether a cat, a dog, or a person. Even a sniper’s own family member. There were many occasions during the war when fighters killed people on their own side. You can’t really discriminate while looking through that hole. It was a sick game. The sniper is probably the worst kind of fighter during any war. You were growing up in Beirut at that time. Any personal memories concerning the snipers? I remember some footage that aired on the local news at that time. The incident took place during one of the many bread shortages in the city. The video showed an older man, in his late 50s, as he was heading home with bread. He was trying to cross a sniper location. When the man tried to cross, he was shot to the ground. People on the other side threw him a rope – which was a common rescue technique at locations near sniping areas. They then tried to drag him to their side. At that moment I was expecting the sniper to just kill him. He was an easy target. But the minute the poor man grabbed onto the rope, while still holding on to the bread, the sniper cut the rope with his bullet. I was an eight year-old kid at that time. When I saw that footage I asked myself, “Is this for real?” The sniper was just playing with the man, cutting his only thread of hope for survival. I want to find that footage and place it in the museum. When the museum opens, the sniping rooms will be a place to come and contemplate what it means to go through war, to kill, and hold a gun against your fellow human. I think it’s a place where people who’ve been through war will have a lot to think about. And people who haven’t will get a taste of what it means to be at war. What do we know, if anything, about the gunmen who used that building? Who were they fighting for? The snipers were from the Christian militias: Phalangist fighters from Dany Chamoun’s party. 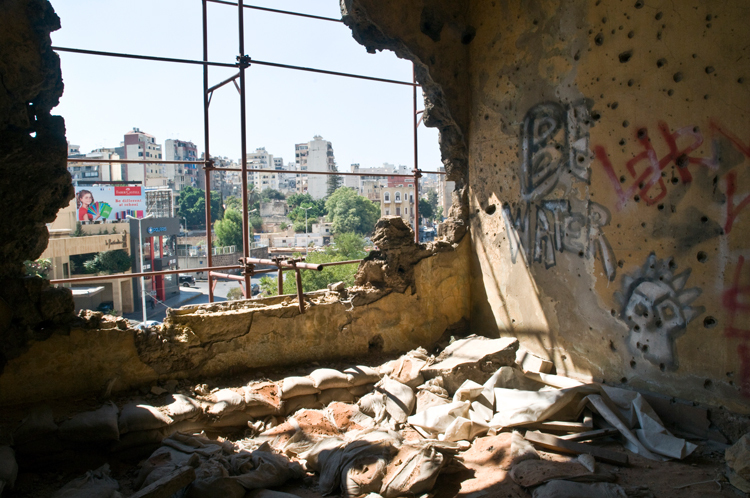 But I always stress that there was the same kind of building on the other side, which was used by the West Beirut militias like the Mourabitouns and the Palestinians – just to name a few. There was equal ferocity and cold-blooded killing happening on the other side. Are you looking for these people? We are. One man has been found who says he was close to them – but not actually one of them. That was a few years ago. He didn’t allow us to interview him except while wearing a facemask. He was a very disturbed creature. He said that because of all the killing he’d done in those years he is unable to live in the daytime. He sleeps during the day and lives his life at night. That’s the closest we got to a sniper who was in that building. We hope to find more of them once the project goes more public. How did you get involved with all of this? It all started after the war. Downtown Beirut was sold to a huge real estate developer which was planning to dynamite and bulldoze about 90% of the area. There was a debate raging about whether we wanted to remember the war and keep our architectural heritage. To me it was an urban catastrophe. I was someone who always looked forward to living in downtown Beirut because I only heard about it from my parents. I was very young when the war started. At that point I went to Italy to do my master’s degree. When I came back in 1994, the downtown area was bulldozed. There was almost nothing left from what I had hoped would be restored. Only 10% of the original downtown remained. In response, I started to look for anything in the city that could give me a sense of history, identity, memory and belonging. When I began my search, the Barakat building was the first one I found. This building has a special effect on anyone who sees it. Even with all of its damage, it has a visual impact that causes you to stop and stare. The building was badly damaged, yet as an architect I was intrigued by the void in the middle. I wanted to go inside and see it. When I finally entered the building, its story began to unfold for me. For instance, the plaque with Dr. Schemali’s name was still on the door to his apartment. When I entered, the floor was littered with his personal belongings. 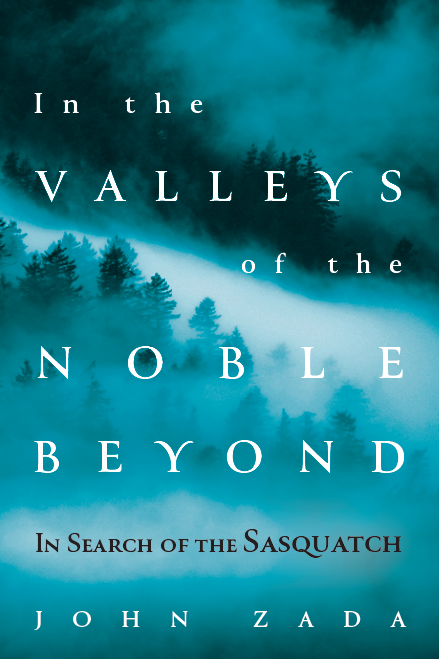 It was as if he’d suddenly left his house and his belongings in 1975 – newspapers, books, intimate letters, clothes, kitchen stuff – and never came back. Of course, there wasn’t anything of real value there because it would have all been stolen during the war. I walked through that space and found all sorts of calling cards. The amazing thing is that they weren’t just from commoners – they were from presidents of the republic, parliament members, and ambassadors from around the world. That guy knew everyone. I found intimate letters from his wife, children and mistresses. I also found newspapers from the 1920s and cinema brochures from downtown Beirut – things related to the history of Beirut before the war. It was the history that brought me back to the building. I considered the place a personal hidden treasure in the city. I took colleagues, friends and foreigners who visited Beirut to see the building. I even took people who I didn’t know – people who I met at nightclubs – on tours of the place. The whole activity became an act to defend the history of Beirut by showing what has been swept away by the general amnesia of Lebanon. Although the Barakat building was badly damaged I never considered it to be under threat. But while passing it one day in 1997, I noticed something was missing. I stopped the car for a closer look and noticed the iron handrails were gone. That indicated to me that someone was going to demolish the building. I went into the backyard and saw that someone had started removing all the iron and art deco tiles. I was told that the building was being gutted and there was only two weeks left before it would be completely demolished. To me it was inconceivable that this building would be turned into a parking lot. So I went straight to the newspapers with the story. Since that day in September 1997, I’ve been waging a campaign to save the building. In 2003 after 6 years of lobbying and working with the Governor of Beirut we convinced the municipality to expropriate the building. 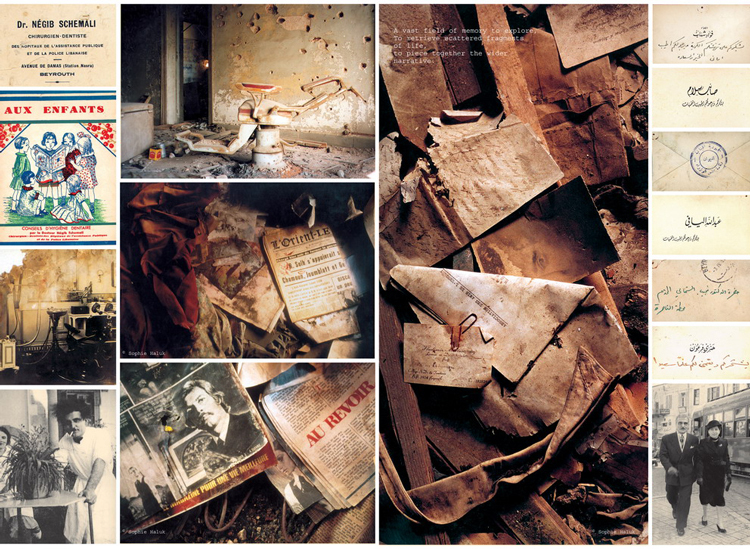 The expropriation decree stated that it would become a museum about the city of Beirut. The building was finally purchased in 2008. That was followed by work on the architectural project. And just over a month ago the mayors of Beirut and Paris laid down the base stone for the construction. In about three years we will have a museum devoted to the memory of the city of Beirut. What will the completed museum look like? The museum will only be restored from the exterior to the extent that it needs to become solid and weatherproof. The scars of the war will be preserved as much as possible. The first floor, which contains Dr. Schemali’s apartment and the sniper constructions, are going to be preserved. And the sniper areas on the first floor will be dedicated to the memory of the war. The visitor will see what the snipers built, the way they used the spaces, and the rooms that are bullet-ridden. But we will only be talking about the human experiences of war. There will be no discussion of timelines, names, political parties or militias. The museum will only explore the subject of what it’s like to be a human participating in war – as either a victim or perpetrator. In Lebanon we need people to understand that war is not a game. This place will be dedicated to teach Lebanese youth about war as a human experience. There will also be sections profiling Dr. Schemali’s apartment, the history of the building, and the original architect, Youssif Aftimos. The second floor will be devoted to the history of urban development, architecture, and the life and society of Beirut since Ottoman times. That will cover the late 19th century to the present day. The aim is to have an interactive museum that people can actually visit many times and still learn something new. It will employ modern technologies. The third floor will be completely devoted to independent art exhibitions: from photography to paintings and sculptures that have as their main themes the city of Beirut. What’s been the reaction in Lebanon to your work? First, I’m very proud of what I’ve done. I’m proud that many people consider this an example to be followed. But throughout the entire 15 years of this fight, the only thing I’ve heard from people is “Don’t waste your time. It’s not going to happen.” With all of the political instability nowadays, heritage and restoration are not big priorities for the government – or the people. I only succeeded by being persistent and making sure that people thought twice about what they were doing. The whole thing has shown people that if you really believe in something you can achieve it – even in such a corrupt city like Beirut. And even in a place where real estate speculation doesn’t give you a chance to think about saving a heritage building. But at the same time I have a bit of sadness because it was really one or two buildings that got saved in that whole 15 years of struggle. I didn’t lobby for only one building – I lobbied for several. Many buildings were torn down throughout the years and were turned into parking lots. And as we speak, this is still happening in Beirut. But at least this experience gave myself, and others, hope that if you really persist in something you can actually achieve it. Why is it crucial, in your opinion, for Beirut to have this museum? Since the end of the civil war there hasn’t been any reconciliation in this city. And it shows very clearly in the way the divisions are deepening. We need a non-sectarian venue where the people of Beirut, and the Lebanese, can really come together. I think that if the people of Beirut know more about their city they would love it more, respect it more, and work better to preserve it. I know Beirut because I’m an architect and I’ve worked on the city. There are no programs in our education system that teach about our collective identity. So we need to address that. And we need to address the war. That’s not to say that the museum will only address the memory of war. But the war did eat up 15 years of life here. Visitors to the museum will find the answers to many questions. For instance: From which quarters did the city originate? From where did the names of the different neighbourhoods come from? How did any given street come to look the way it does today? Who planted the trees in a certain area? When you start to know the facts you begin to grow more attached to your city. Perhaps when people become acquainted with buildings featured in the museum, it’ll be harder for them to tear those buildings down so carelessly. Nowadays you’re seeing Ottoman palaces being bulldozed overnight. If that palace has its history promoted in a museum, its owner might think many times before he tears it down. How are the political developments in the region now impacting your work, if it all? Because of regional and domestic instability, it’s becoming more essential, and more justified, to have a museum like this in this city. In terms of time, we’re being negatively impacted because the government is not functioning as it normally would when things are quieter. Governmental procedures involving our project are now much slower. For instance, we didn’t get certain approvals for many months. And there are expected to be more delays. Yes. The problem is that people who were part of the civil war were always afraid that this building would reveal the way the war was waged. With this museum, no one would be able to say anymore that they didn’t have snipers, or that they were fighting clean battles. Instead, the museum would tell the story of how horrible the war was. Anyone who was a leader during the war was afraid that the museum would be a place where questions would be asked – and answers would be required. It’s a place where, as a leader, you would need to justify what you did; or at the very least, apologize. Did you know there was only one public apology since the end of the Lebanese civil war? After all of this time, not one other apology has been made. And not a single monument to the civil war has ever been built. After almost a generation of reconstruction there is not one museum, or centre, that addresses the 15 years of fighting and how 100,000 Lebanese were killed. All you find in downtown Beirut are boutiques, expensive cars and the souqs of Calvin Klein. The amnesia that swept the city and led to its heart being transformed into a place for the rich – and for Gulf Arabs – is regrettable. You go there now and it’s just a theatre of restored facades that are completely empty. They rebuilt a neighbourhood that’s not for the people. And this subject has to be addressed when we talk about the history of Beirut.